Window signage is a great way to draw attention to your business, provide business information, and promote specials! Window signage is a surefire way to make sure you are marketing your business in an effective way. Thanks to window signage, you are guaranteed to draw in the eyes of customers and intrigue them with your memorable branding. 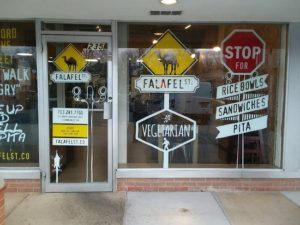 There are four different types of window signage that each bring their own set of unique advantages to your business’ marketing strategy. To figure out which type of window signage works best for you, simply read on. First, off, there are vinyl window decals. Typically used for storefronts to display store hours and information, vinyl window signage is perfect because of how easy they are to apply to your window. Another added benefit for this type of window signage is that they can be cut into any shape, allowing for a variety of different potential font types and designs to be chosen from for your window signage. There are also plenty of spectacular, bold colors to choose from as well to make your window signage eye-catching. Perforated vinyl window film is a type of window signage that unnoticeable, small, evenly spaced holes throughout the surface of the signage, while still being full of color. One of the big advantages that perforated vinyl window film has against its window signage counterparts is that thanks to its perforation, it gives those inside a building or vehicle full vision through the window, while those outside can only see the window signage itself. This makes it especially useful for cars as it lets you utilize your window space for marketing without obstructing your vision. Unlike the previously mentioned vinyl window signage options, static cling stickers have no adhesive backing. Instead, they come in the form of thin, plastic sheets that are then printed on a translucent rectangle. They are the easiest to remove and reapply, making them perfect for businesses that experience lots of change, like for example promoting seasonal sales. Frosted glass window film is another type of vinyl window signage that takes the appearance of etched glass. It is a perfect substitute for frosted or etched glass, and can create a sense of privacy by restricting vision, but still allow natural light to come inside. If you are looking for a cool custom way to decorate your vehicle or advertise your business, make sure to check out Brand It, Wrap It, Custom Signs and Vehicle Graphics. We are a full-service sign and wrap company that provides excellent quality signage for businesses both big and small throughout the Maryland, Virginia, and Washington, D.C. metro area. We provide awesome customer service, use the best and latest sign printing technology, and pride ourselves on our attention to detail. To see how we can help your business shine, give us a call at 301-838-9727 or visit us online for an estimate. For more tips and articles like this, follow us on Facebook, Twitter, Google+ Pinterest, and Instagram. Also, be sure to check us out on episodes of Junkyard Empire throughout the season, on the Velocity Channel every Wednesday night at 10:00 pm for even more tips and tricks about vehicle graphics and fleet wraps! This entry was posted on Friday, October 5th, 2018 at 1:42 pm. Both comments and pings are currently closed.